An agronomist on the pre-show tour at Ak-Chin Farms in Maricopa, AZ. Now about a week removed from our second annual PrecisionAg Vision Conference in Phoenix, AZ, it’s glaringly clear that ag tech as an industry sits at a bit of a crossroads. The integration of ag tech innovation into every level of the food production ecosystem remains this industries’ greatest opportunity, as well as its greatest challenge. And while we all tend to get wrapped up salivating over the possibilities — in our defense the potential payoff does appear to be quite abundant if we get it right — it seems that the inherent risk we face in possibly getting this whole thing wrong weighs quite heavily on the minds of all involved, as well. Yet, for the moment there’s no generic “adoption playbook” on right-sizing ag tech integration, from a grower, service provider, or food production industry standpoint; no “Ag Tech Integration for Dummies” manual that we can plunk down $19.95 for at the local bookrack, read in a couple days, and feel like the second coming of Jim Cramer. On top of that, once that nasty little bug known as Uncertainty enters the mind, his obnoxious little adoption-stalling buddies Doubt and Apathy tend to creep into the picture as well. What fights against the rhythmic slog of those three innovation-choking buzzwords? Ground truthed, rooted-in-experience-knowledge dissemination, or transfer, among those looking to alleviate such burdens. Well, don’t shoot the messenger or anything, but as of press time I’m dismayed to report that we didn’t solve all of ag tech’s problems over a couple days in a Phoenix hotel conference room. Bummer, I know. But we did come away from the meeting with a few interesting tidbits, at least in our minds, of what transpired out in the desert. 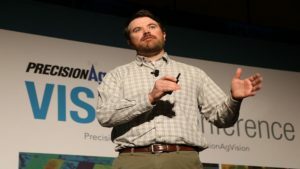 New Techs Imminent: A few innovations presented at Vision that could hit farm fields in the next five to ten years are worth keeping an eye on as we go into the winter months. Blockchain, which takes data ownership principles from the world of cryptocurrencies like Bitcoin and applies them to large aggregated data sets, could have vast application in farming circles. Another is CRISPR gene editing, and there were some very pleased rural-broadband access advocates in attendance after hearing Microsoft’s Ranveer Chandra discuss initially promising R&D the company is undertaking on transmitting WiFi signals across wide geogrpahies over the old VHF/UHF radio operating frequencies. Our plan (what’s that saying about men and their plans?) for now is to follow up with Chandra on the progress of that project in the coming months, as well as some interesting R&D Microsoft is doing on drones and drone battery systems around flight time. Stay tuned! 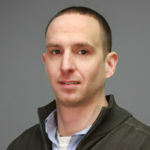 Alltech Chief Innovation Officer (CIO) and VP of Corporate Accounts Aidan Connolly. Artificial Intelligence Could Potentially Disrupt Agronomy: Artificial Intelligence (A.I.) might be your friend now – it’s so nice when we upload those Facebook pictures and the AI engine automatically recognizes and tags our friends – but that could change in the near future. “We could see A.I. 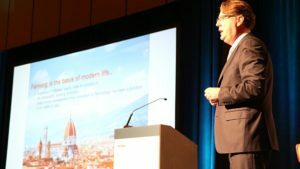 allowing retailers to get away from their current heavy reliance on knowledge and experience,” Aidan Connolly, Chief Innovation Officer, Alltech, argued. His example? Heavy equipment giant Caterpillar has a mobile app where if a customer experiences a mechanical issue, they open the app and use the mobile device’s camera to scan the area of the equipment that is malfunctioning. The app uses augmented reality to pinpoint and display the exact problem, tells the user what parts to order and even how to fix the machine once those parts arrive. Something similar for growers would be a huge blow to an industry where recommendations are still mostly delivered by a sales agronomist with a smile and a handshake. Retail Itself is Changing: Schmarzo had another thought for crop input retailers to ponder in that the traditional brick and mortar retail business model itself is under attack. What the “Big Data Professor” was referring to is the way future generations view the shopping experience. “This younger generation is changing the face of retail, from that of large footprint super stores to smaller stores that are more focused on providing a ‘social experience’ around brands, with less inventory on-hand and more products being delivered direct by things like drones or crowd-sourced delivery vehicles (think Uber Eats). Is your operation ready for this shift in how the next generation demands to shop? 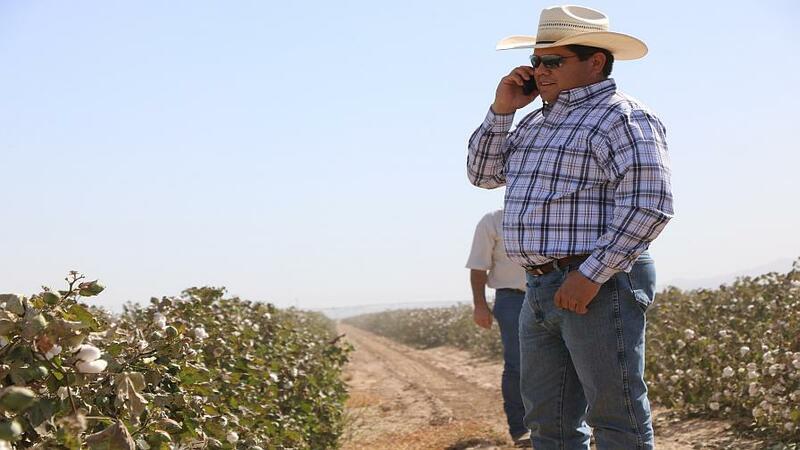 Danny Royer, VP of Technology, Bowles Farming Company, Los Banos, CA.